Ontario Liberal Leader Kathleen Wynne speaks to the media at Queen's Park in Toronto on June 4, 2018. 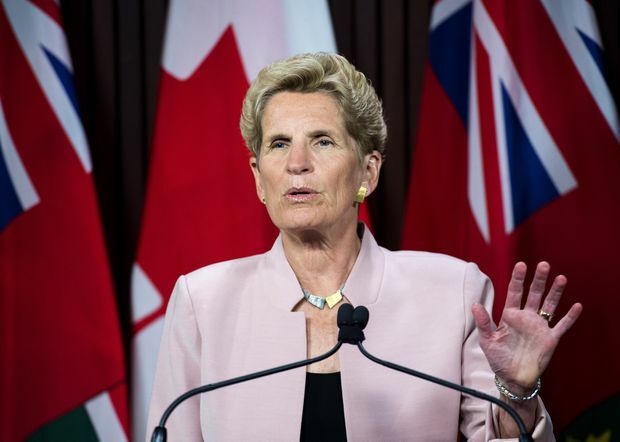 Ontario’s Liberal premier is making last-ditch efforts to warn voters away from electing a majority NDP or Progressive Conservative government, after admitting over the weekend that her party can’t win Thursday’s election. At a morning event in Toronto on Monday, Kathleen Wynne stressed voters are and should be concerned with the possibility of either of her opponents seizing a majority, and declined to say whether one option would more alarming than the other. “I am saying that there are risks associated with both and I just am asking that people look at those risks,” she said. Wynne said an NDP majority government would lead to indefinite strikes because of a rigid ideological opposition to back-to-work legislation. The premier also said she thinks Tory Leader Doug Ford has turned out to be “even more disturbing to people” than expected and she has talked to Conservatives who don’t want to vote for him. The Liberal leader’s bombshell weekend announcement predicting her party’s loss came as a surprise to at least some of her candidates, who said the decision was laid out in a conference call shortly before it was made public. Some said they learned of it through social media. On Saturday, Wynne acknowledged that some of her slate may be angry or sad, but she said Monday the feedback has been largely positive. “What I’m hearing from candidates is that it is allowing them to make the argument at the door that there will the change that people are looking, there’s change that people want – that I will not be the premier, that the Liberals will not be forming a government,” she said. In the riding of Toronto-St. Paul’s, which has historically been Liberal, the party’s candidate Jess Spindler said that regardless of Wynne’s decision, she will continue to pitch herself as a voice for the community on issues such as child care. “I think right now there are people who are feeling a little uncomfortable, and I want to say to constituents who are feeling that way, many of whom I’ve spoken to at the doors, that I am here, I’ll be a strong local champion and I hope you’ll consider me as your representative,” Spindler said. Asked how constituents were responding to Wynne’s plea to vote for some Liberals, Spindler said it was difficult to gauge and only the election itself would reveal how well it resonated with voters. Eva Taylor, who lives in the riding, said she cast an advance ballot for the Liberals before Wynne’s weekend announcement and hopes the move wouldn’t dissuade others from backing the party. Chris Glausser, another resident of the riding, said there’s “no way” he’s voting Liberal, in spite of Wynne’s call. Barry Kay, a political science professor at Wilfrid Laurier University in Waterloo, Ont., said it’s unclear whether Wynne’s admission will change the dynamic in the last days of the campaign. Political analysts had predicted a shift after the last debate but that did not materialize, he said. However, past polls have suggested that voters who switch from the Liberals tend to prefer the NDP over the Tories, he said. “One of the things that I think may happen is a lot of Liberals will just stay home and just not vote at all because the leader has said, ‘This isn’t going to happen’ so why bother,” he said. In a later event in Sarnia, Ont., Horwath repeated her opposition to back-to-work legislation that Wynne has hammered her for, but said she remains confident an NDP government could tackle labour disputes such as the ongoing months-long strike at York University. “I will also make sure that we are able to bring good work back to our university and college system, and that is one of the problems we now have. The colleges and universities are being squeezed, the workers there are part time, working contract to contract,” Horwath said. Ford has so far said little about Wynne’s decision and his campaign said Monday it remains focused on delivering his message to voters.